Rajeev Gandhi Park is fast becoming a major tourist and local attraction because of its unique look and strategic location. Beautiful lakes and gardens are the hallmark of Udaipur. Be it quality or quantity, Udaipur is way ahead. The distinguished feature of gardens here is that most of them are made in locations where even the concept of a garden is inconceivable. Be it Nehru garden which is situated in the centre of Fateh sagar, Moti Magri which is developed on a hill, or the recently developed Rajeev Gandhi Park which also is on a hill, all have added value of being situated at a different location than a normal garden. The view of the park and the view from the park, both present an exotic scene. The design of garden is such that most part can be seen from distant place. Spacious Children Park is a wonderful thing here. Food court is also fully functional and its agreement has been signed for five year term. The grandiose look of the garden and its location make it a very important tourist spot. Foreign and local both visitors are showing great interest in the park. 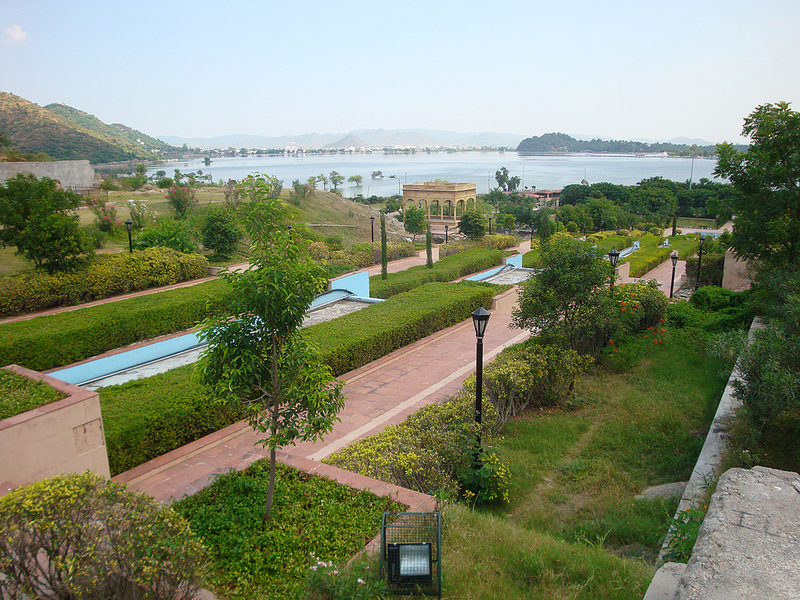 Rajiv Gandhi Garden situated in Udaipur located at the back of the lake Fateh Sagar. The garden contains a statue of Late Rajiv Gandhi, children’s park, food couts and lots of more attractions. The garden is full of beautifully carved statues depicting different animals, beautifully maintained flora, spectacular waterfalls and much more. The garden is well located and one can easily reach the garden and can spend some quality time in the garden. Rajiv Gandi Garden was built and inaugurated on 8 May 2008 by political leader Vasundhara Raje. It was built in memory of Late Rajiv Gandhi, who was the youngest Prime Minister of the Nation. This garden has beautiful fountains, trees and greenery, many statues depicting wildlife and animals throughout the garden, showing importance of plants, wildlife and conservation of water. It gives an impression of Mysore's Brindavan Garden. Besides this, there are numerous other attractions nearby like Sanjay Garden, Shilpgram, Fateh Sagar, Saheliyon-ki-Bari etc. It is easily accessible from the city by local transport, taxis or autorickshaws. It is around 8.5 km from Udaipur City railway station.